A few weeks ago we attended and featured Lunchables: Field Trips For All kick off event with Kevin Jonas at the Natural History Museum in Los Angeles. I hope by now you have gone to the site to vote for your favorite deserving classroom to win the ultimate field trip! If not, you have until June 1st - so head on over before it's too late!! I am a strong believer in hands on learning and believe children can take in so much more having fun while learning. Lunchables gave us a great opportunity to take our very own field trip with one lucky family accompanying us. We decided, well actually the kids decided to go to the Los Angeles Zoo. It's a great way to give the kids an up close and personal view of animals from around the world. Before lunchtime the zoo sets up stations around the zoo with animals you can view and touch up close. Below the kids had an opportunity to feel what a snake feels like - I was surprised they all had no problem touching it! I think the biggest hit with both families was the gorillas. We stood there and watched a mother, father and their five year old play around. They always amaze me how human like they are! As we walked around the exhibit the five year old gorilla seemed to follow us and want to play. There was a long rope that was hanging down from the fence but in reach for him. He would grab the rope and throw it to my husband to play tug a war. It was so cute!!! I wish I would have gotten some footage of that - it was total youtube moment!! The baby gorilla kept wanting to play even as my husband walked away - making it difficult to walk away!! How do walk away from a child who wants to play? So cute.....but there was a zoo volunteer standing nearby who way eyeing my husband so we decided to end it and move on :P Below is a picture of us and the family who was chosen to come along. This was their first time at the Zoo and they were truly thankful!! 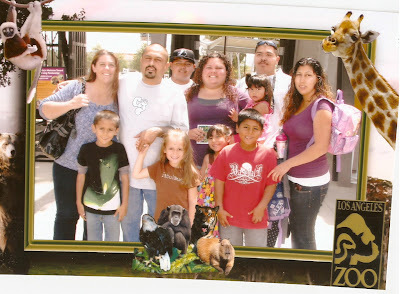 **Lunchables provided us with tickets for the chosen family as well as zoo bucks to spend while we were at the zoo! Thank you for such a wonderful experience!